Welcome to the first of what we hope will become a annual get together with geocachers from Canada and the USA. This event is being co hosted by British Columbia Geocaching Association and the Washington State Geocaching Association with the idea of getting cachers from Canada and the US together for an international geocaching event. The idea for this event came about during a informal meeting with the BCGA President Bajabetty and the WSGA President Mc3cats at a Tim Hortons in Abbotsford, BC. We discussed our organizations, the difference and similarities between the two organizations as well as geocaching in the great Pacific Northwest. The topic of geocaching events came around and we talked about how cool it would be if the two geocaching organizations got together and co-hosted an international geocaching event. We both agreed that Peace Park was the obvious location for such an event with the park straddling the international border. We talked about how the event could be held annually and would switch sides of the border every year. This year, inaugural event will be held on the U.S. side of the border. We have rented out the American Kitchen facility. This day use building has a full sized kitchen. There is a large outdoor grill (3ft X 3ft), big picnic area, restrooms etc. April 20th was chosen as it is a free Washington State Parks day. No entrance fees/discover pass will be needed to get into the park on the day of the event. The event will be a pot luck style event. The BCGA will be providing the burgers for the event. We ask that cachers bring sides and beverages. We ask that you indicate in your will attend log how many people in your party AND indicate what side dish you plan to bring to the event. The event is open to all. You do not need to be a member of the BCGA or the WSGA to attend this event. 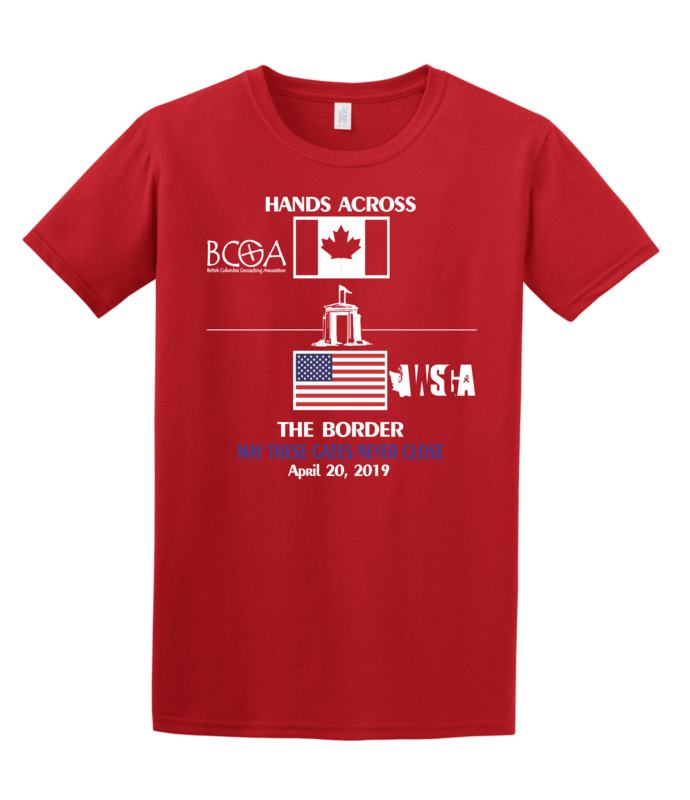 To commemorate this event, we connected with Red Hat Imprints to put together a T-Shirt that you can purchase. You can order your shirt directly through Red Hat Imprints HERE. They also have long sleeve shirts, sweatshirts and totes. If you purchase a shirt, you can avoid shipping and we will have your shirt available for pick up at the event. Below is a sample of what the shirt looks like. Please note that the deadline to order your shirt to be able to pick it up at the event is by April 1, 2019. Orders after 4/1/19 will need to be mailed to your home address. We will also hold a raffle at this event. If you would like to donate a raffle item, please note that in your "Will Attend" log and bring your raffle items to the sign in table at the event. Looking forward to meeting our geocaching neighbors who reside north of the 49th parallel at this event!